From the hard-covered book “The Most Beautiful Libraries in the World”, library lovers will find the following quotes dear to them. Though cannot show the breath-taking pictures in the book, I have found boredstop.com contains similar photos. Be sure you click here to visit. “One must spend hours upon hours, and days upon days in the cocoon of a great library in order to understand and love the cozy isolation that it can provide. Some people will never break away from its spell and remain eternal readers, having lost the desire to discover the real world. Others will know how to find in libraries both knowledge and its instruments. A painting in my office in the Library of Congress’s Thomas Jefferson Building bears the Latin inscription Liber dilectatio anime: Books, the delight of the soul. 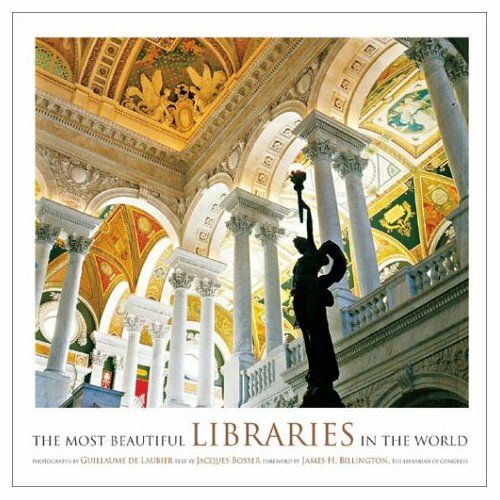 All libraries celebrate this delight, which is reinforced by the sheer beauty of the libraries featured in the pages of The Most Beautiful Libraries in the World. The libraries in this book are special because they ally architecture with literature. …The Alexandria Library reminds us that all human endeavors are organic – they are born, they live, and then die. As long as a library is both useful and is used, it will grow. When it no longer answers to its calling, in time it will lose its importance and, at best, its rich collections will be consulted only by historians, if by anyone at all… The great monastery libraries were, for a long time, the seat of knowledge where one could study not only the works of the Church fathers (in Greek and Latin), but also those of Greek and Latin philosophers as well as Arab scholars. These libraries were instrumental in the establishment of the power of the Catholic Church… the center of learning had once been the monastery, it now became the university. The Roman Catholic Church’s opposition to the powerful humanist and scientific movement that began sweeping across Europe at the end of the Middle Ages and its rejection of the Enlightenment, gradually caused philosophers, scholars, and students to turn away from the Church. Beginning in the seventeenth century, kings and princes, such as Mazarin and the Austrian emperor Charles VI, opened their libraries to the public. Universities, whose ties with religious hierarchies (whether Catholic, Protestant, or Anglican) had disintegrated, built (at considerable cost) great libraries such as those in Cambridge, Dublin, Coimbra, and Bologna. And finally, in the nineteenth century, states and cities began to create large libraries which, for the most part, were open to the public and covered all fields of knowledge. Today, the intellectual prestige of a country is still based upon its network of libraries, how much it is used, how well it is organized, and it is computerized. Culture, most broadly defined, is at last there for everyone. This entry was posted in books, Preservation Room and tagged The Most Beautiful Libraries in the World. Bookmark the permalink.